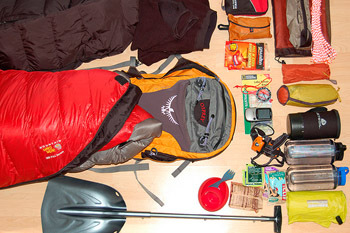 The differences between your survival gear list and your camping and survival gear for a weekend in the woods will be minimal. The main difference will be the time scale that you're expecting to use the survival gear. Kit for a camping trip assumes that you'll be returning to the civilized world eventually, so everything is disposable and lightweight. In the case of an apocalyptic event, you will need things that are re-usable and self-sustaining for a period of days, weeks or possibly months. Knife - A knife has so many different uses that it should be the first thing that you buy. It doesn't have to have an enormous blade, and the best survival knives will have blades of less than 10 inches. This makes them useful to cut meat, cloth and wood without being unwieldy. If you can, aim to buy two, one with a straight edge for cutting and the other with a serrated edge for sawing. Gardening tools - You need to start thinking as soon as possible about becoming self-sufficient in terms of food. Including a good set of gardening tools on your survival gear list, such as a trowel, a fork and a hoe, will help you turn any patch of land into a renewable food source. Fire starter - Most people think to pack matches in an emergency, but these can get wet or fail to light. A small steel and flint lighter will start hundreds of fires and you don't have to worry about running out of lighter fluid. Non-electric tools - This includes things like a saw, a hammer, a screwdriver and a wood axe. These should be kept away from your usual tool set so that they are in pristine condition when you come to use them. Rifle - By successfully hunting larger animals, you provide meat and fat for many days. Bow -You can continue to hunt after the rifle shells have run out, if you have a bow and arrows. Try to find a brand with arrows that are easy to copy, and try making some yourself. Handgun - Useful in case of human invasion on your property. Handgun rounds tend to poison meat so use this only for self-defense. Traps - These can be used to protect the perimeter of your property, or to capture small animals like rabbits for food. Most people imagine that in an apocalyptic event, everyone will be reduced to walking. However, you may find that your current location isn't safe, either from the natural forces or other people. In this case, you should prepare a bug out vehicle, to use specifically in an emergency. These tend to be sturdy vehicles like SUVs or trucks, often older vehicles that lack the computerized components that might fry in an EMP. Stock the vehicle with most items from your survival gear list as well as supplies of freeze-dried food, water purification tablets and cold weather clothes. You should keep it topped up with gas and fill up a couple of gas cans with spare gas while prices are still low. Finally, make sure that you have a tent and sleeping bags stowed away in case you need to drive for long distances.